Equation-of-motion (EOM) is a versatile electronic structure approach that allows one to describe many multi-configurational wave functions within a single-reference formalism. For example, EOM for excitation energies (EOM-EE) method accurately describes electronically excited states, while ionized/electron attached EOM models (EOM-IP/EA) can tackle doublet radicals, including notorious cases of symmetry breaking. We have extended EOM approach to diradicals, triradicals, and bond-breaking. In our approach, which is called the Spin-Flip (SF method) problematic low-spin states are treated as spin-flipping excitations from the high-spin reference state. All of the above singlet wave functions are two-determinantal. The Ms = 0 component of the triplet is also two-determinantal, however, the high-spin triplets (Ms = 1/Ms = -1) are single-determinantal. 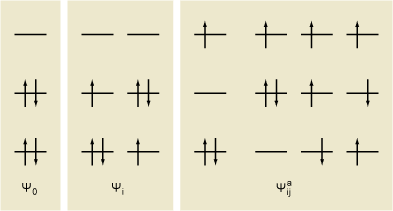 Note that all the Ms = 0 determinants are formally single electron excitations with a spin-flip from the Ms = 1/Ms = -1 configurations. Therefore, the Ms = 0 states can be described as spin-flipping excited states from the high-spin |α α> triplet reference. This is the essence of the Spin-Flip (SF) method. The SF method describes ground and excited states of diradicals (or potential energy surfaces along bond-breaking coordinate) as spin-flipping, e. g., α→β, excitations from a high spin |α α> triplet reference. Similarly, electronic states of triradicals are described as spin-flipping excitations from the high-spin component of the quartet state. The SF approach allows one to describe multi-configurational wave functions in a size-consistent fashion and within a single-reference formalism thus resulting in efficient, accurate, and robust computational scheme. Electron transfer reactions are common in biological and synthetic polymers. 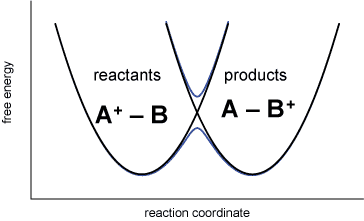 The rates of these processes can be related to the coupling between the diabatic electronic states that correspond to reactant and product states. Calculations on these systems are difficult due to the propensity of Hartree-Fock solutions to overlocalize charge and break symmetry. Positively charged ethylene dimer is an often-studied prototype system for perpendicular hole conductance. The reaction coordinate slowly interpolates between neutral and cationic geometries of monomers in the dimer. The EOM-CCSD method relies on the unstable Hartree-Fock solution for the open-shell doublet system, which is the positively charged dimer. It predicts excessive charge localization and a cusp on the potential energy surface. In contrast, EOM-IP-CCSD predicts a smooth charge flow along the reaction coordinate as well as smooth PESs. This method employs stable reference wave function of the neutral, which is a closed-shell singlet system, and describes both charge-transfer states in a balanced fashion. Current research includes development of reduced scaling methods, efficient tensor algorithms, as well as novel EOM models to deal with other types of open shell systems and metastable electronic states (resonances). In addition, we are developing tools for describing non-linear response properties.